An Excerpt From Our Latest Newsletter - Aurora, Naperville, Oswego | O'Donnell Commercial Real Estate Inc. In our September newsletter last year we discussed the extreme growth Huntley, Illinois is experiencing, "From the years of 2000 to 2008, the town quadrupled its population...and from 2010 to 2012 the population increased an additional 10%. As the amount of rooftops increase, the need for physicians will follow... Another draw for physicians may be the high home ownership rate. According to NerdWallet magazine, the village has a home ownership rate of 93.5%, and quickly growing. For physicians, this means patients will REMAIN patients. They have purchased their house and put down roots." Since then our firm has seen an increase in the number of physicians looking at medical spaces in Huntley. Between the growth, and the brand new Centegra Hospital under construction, doctors are realizing the future need for medical practitioners in this market. With that said, we are proud to announce that our firm has been selected as the exclusive listing broker of the brand new, state of the art Medical Office Building on Centegra's campus. Duke Realty has hired our firm to pre-lease space for this facility. Many practitioners, in a variety of medical fields, have already expressed interest for space at this building. 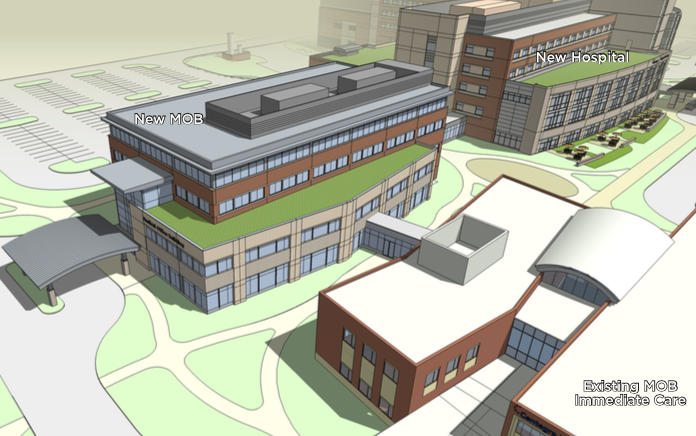 This image shows the new Duke Medical Office Building connected to both the New Centegra Hospital and the existing Medical Office Building with Immediate Care facilities. Also on this campus is the Fitness Center. Historically our firm has completed many medical transactions throughout the Chicagoland area, with an emphasis on the suburban market. process...to save you time and money! Whether you are interested in the Duke Centegra Medical Office Building or an office nearby, please contact us. Remember our tenant representation services are always FREE!